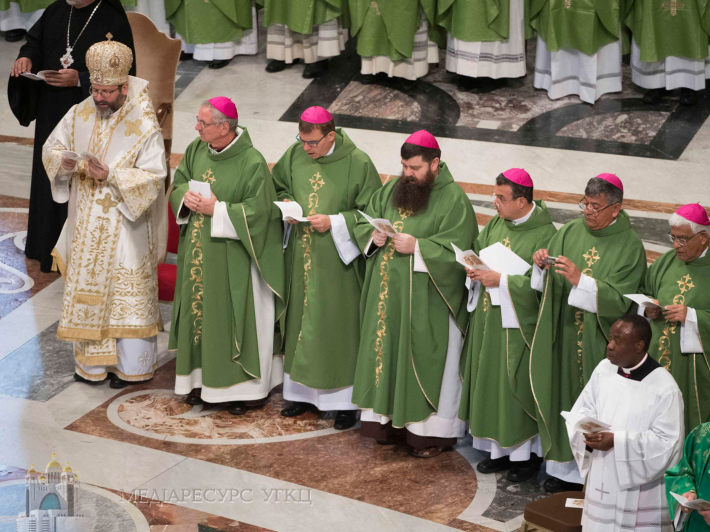 General Assembly of the Synod of Bishops on “Youth, faith and recognizing devotion” was finished in Vatican with a Thankful Mass which was served by His Holiness Pope Francis on Sunday, October 28. His Beatitude Sviatoslav, Head and Father of UGCC also participated in this Service. In a closing homily of the Synod Pope Francis pointed at authentic way of Christian calling: to show faith with a personal example and being open to a neighbor. Considering possible dangers to accomplishing this mission, Pope Francis referred to “doctrinalism” which aims at imposing ideas on others, and “activity” which minimize Church to social institution and faith to moralism. At the end of the Synod His Beatitude Sviatoslav had an opportunity to talk to His Holiness. He thanked Pope for supporting Ukraine and was assured by the second one in a fervent prayer for peace in Ukraine. Pontifical Synod, dedicated to young people, was held in Vatican during October. At the end of work synodal priests adopted a final document. According to a decision of His Holiness Head of UGCC was included to the members of working commissions. During the Synod His Beatitude Sviatoslav had an opportunity to deliver a homily twice. He emphasized that Church’s mission is not narrowed to only pray for youth but to pray with youth. He also portraited the realia of UGCC in times of war. “War is not a cause of our society’s suffering. What matters is a severe economic crisis and great wave of migration, which mostly affects youth”. The Major Archbishop clearly underlined that Ukraine is a victim of Russian aggression. “Young Ukrainians who belong to different ethnical and cultural groups, are of different religions die from war in Ukraine, becoming real heroes of social transformation”. Polish side of Vatican web-page characterized a speech of His Beatitude as “act of courage and truth of Gospel”.